Terminals as the title says allows you to control most of the remote connections i.e. 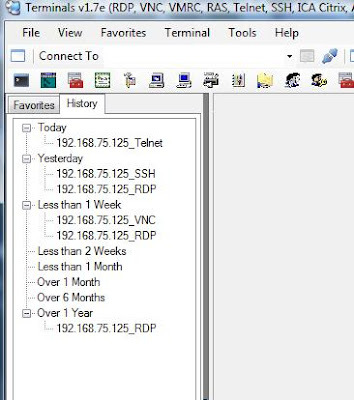 RDP (Microsoft’s Remote Desktop aka Terminal Services), VNC (Virtual Network Computing), VMRC (Virtual Machine Remote Control), RAS (Remote Access Service), Telnet (Telecommunication Network) SSH and ICA Citrix from a Tabbed interface making you task easier by not wasting time on looking which connection is open where. You can manage more than 100 connections of different type without any issues.